Last night Beyonce and Jay-Z performed during the On the Run II Tour at the Levi's Stadium in Santa Clara, CA. Before the show, Bey wrote: "So happy to be in the Bay! 3 more shows to go!" Nominations for the 2018 People's Choice Awards have been announced and Beyonce is up for 5 awards! The show will be broadcast live from Santa Monica on Nov. 11 at 9 p.m. ET. Voting is open now at pca.eonline.com. Last night Beyonce and Jay-Z performed during the On the Run II Tour at the Stade de France stadium in Paris, France. Again, Bey had two new costumes. After the show, she wrote: "Night one in Paris complete. Can't wait to see more of you tonight!" Beyonce and Jay-Z performed during the On the Run II Tour at the San Siro stadium in Milan, Italy on July 6. Bey wore two new outfits. Beyonce performed during the 'On the Run II' Tour with Jay-Z at Hampden Park on June 9, 2018 in Glasgow, Scotland. The singer wore one new outfit by Peter Dundas. After the show, she thanked her fans on Instagram: "Thank you Glasgow for being an amazing audience!" She’s known as Queen Bey for a reason! Beyoncé and Jay-Z kicked off their On the Run II tour in Cardiff, Wales, on Wednesday, June 6, and while the show is epic for so many reasons (think: insane musical talent, jamming songs, gorgeous costumes), we couldn’t help but be mesmerized by Beyoncé’s #flawless cascade of curls. So you can imagine our delight from Bey’s longtime hair colorist Rita Hazan (the same woman who crafted the perfect shade of blonde for those history-making 2018 Coachella performances in April) agreed to spill all the details on the summery strands. “I got a call that Beyoncé wanted her hair color to be super dramatic for this show which is why I jumped on the soonest flight to Paris to meet with her last weekend,” Rita tells Us. When it came to deciding on the perfect shade, the colorist, who first started working with Bey about seven years ago at the recommendation of the diva’s hairstylist Kim Kimble, explained that it was all about minding the details (i.e. lighting, wardrobe, makeup, etc.). While the half-up style and tight ringlets are similar to the waist-grazing urban glam look she sported at Coachella, the On The Run II hue is noticeably warmer than the music festival’s ashier blonde. The new shade is the perfect complement to her sculpted golden goddess makeup look, complete with a neutral lip, shimmering eye and graphic winged liner. Beyoncé returned to Coachella last night for the second weekend—and her second performance as headliner. The performance wasn't streamed this time, and despite an initial announcement, SiriusXM radio's live stream didn't include her set. Visually the show was refreshed, with Beyoncé and her 100 dancers and band members washed in shades of magenta and virtually every ensemble the singer wore was swapped out for a new look. The set-list, however, remained untouched and she was again joined by husband Jay-Z, former Destiny's Child bandmates Kelly Rowland and Michelle Williams as well as her sister Solange Knowles. There was an extra surprise, as the singer was also joined by J. Balvin for a quick run of "Mi Gente." Beyoncé's Coachella merchandise collection was expanded with two new items, which are now available on the Coachella Pop-Up Store website. On Thursday, Beyoncé hosted a holiday party for her record company, Parkwood Entertainment, at the Wilshire Ebell Theater in L.A. There was a screening of Lemonade (complete with popcorn featuring a silhouette of her in "Formation," and Lemonheads candy) and a full-blown exhibit of all Bey's Lemonade costumes. The singer took to the stage to perform "All Night"! Check out the new Holiday arrivals at Shop.Beyonce.com! Two new "Slay Or You Get E(lemon)ated" T-shirts are available for pre-order on Shop.Beyonce.com! New Formation World Tour merchandise is now available for pre-order at Beyonce's Sidestep store! It's less than a week until the second U.S. leg of the tour kicks off in East Rutherford! Katie Baron’s Fashion + Music delves behind the scenes to understand the beginnings and making of Beyonce’s iconic style. Written by former Dazed and Vogue contributor and trend forecaster, Katie Baron, the book gives a unique insight into how fashion and music, working as twin agents, have reflected but also influenced popular culture. It features exclusive interviews with the creatives behind some of the most iconic and era-defining looks of music’s greatest heroes, including Beyonce. It explores the power of fashion as a make-or-break tool within the music industry’s creative process and gives context to the sound. ​There are two chapters featuring Beyonce and her work with B Akerlund and Jenke-Ahmed Tailly. The Akerlund chapter looks at their partnership for the campaign announcing the 2013 Mrs Carter World Tour, and the 2013 "Beyonce" visual album in particular the styling for "Superpower". The Tailly chapter is solely focused on the partnership between Beyonce and her former creative director and that unique time period in Beyonce's career. Check out exclusive pictures from the book in the gallery and remember to credit BeyonceOnline.org when sharing! The book is available now through Laurence King Publishing. 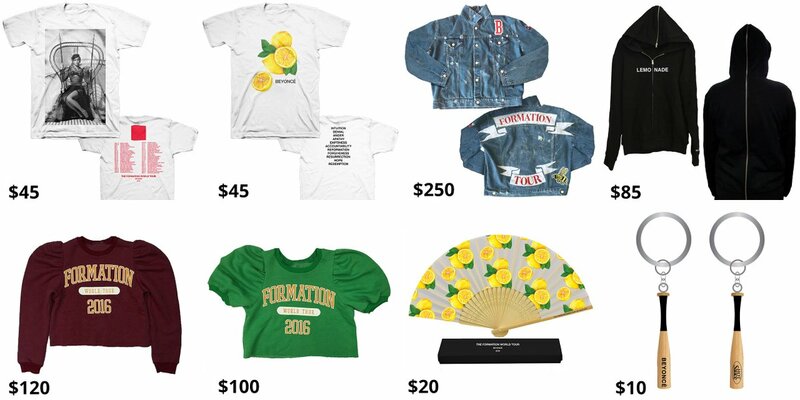 New "Lemonade" merchandise is available for pre-order on Beyonce's official store! Beyonce performed during the Formation World Tour at Friends Arena on Tuesday, July 26, 2016 in Stockholm, Sweden. UPDATE: In the gallery you'll find a sketch of the new outfit Beyonce wore. Costume designer Marni Senofonte gives a look behind the scenes of the wardrobe of The Formation World Tour. Francesco Scognamiglio has designed one of the outfits that Beyoncé will wear on Monday night in Milan on the stage of her “Formation” world tour. The Neapolitan designer, who debuted his first haute couture collection in Paris earlier this month, realized a hooded bomber jacket entirely covered with Swarovski, as well as a pair of pants combining crystals with precious floral-inspired decorations. “I wanted to interpret the energy, strength, femininity and talent of a real style icon through my personal point of view with the goal of creating an unforgettable look,” Scognamiglio said. Since the early stages of his career, the designer has often worked with international celebrities, in particular Madonna, who wore a Scognamiglio outfit in her “Give It 2 Me” video, directed by Tom Munro in 2008.